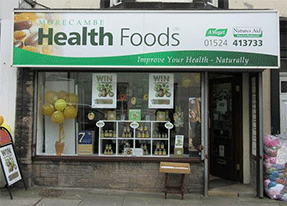 This month we speak to Nicola Parker, medical herbalist and owner at Morecambe Health Foods. If you’ve given up the strong stuff for January, your local independent health store has plenty of tasty alternatives. Fizzy alcohol-free drinks such as warming ginger ale or fragrant elderflower presse tend to be most popular with our customers. It’s the alcohol-free drinks that have more of a flavour kick that people are drawn to. When you’re looking for soft drink options as a grown-up, you don’t want them to taste like the pop that you used to drink as a child. You want more of a strong, almost alcoholic taste or one that’s more herbal-based and sophisticated. Some of our customers create their own mocktails with combinations of the fresh juices. For example, pairing cherry and cranberry juices together. The juices that can be found in store are much more potent than what you would find in supermarkets. They also taste more like a treat than the usual juice drinks you would get off the shelf. The liver’s main job is to detoxify your body but it’s a good idea to give it a little help from time to time. In terms of supplements, the key one is milk thistle. It works by encouraging your liver to repair and regenerate itself. If people are looking for more of a stimulating supplement to help relax the digestive system, milk thistle supplements that combine with dandelion can be beneficial. The root of dandelion helps the liver in breaking down and getting rid of toxins as it increases your bile flow (which is a natural laxative). Some naturopaths recommend taking a milk thistle supplement for a short period at the change of every season. I personally think January is the best time to start taking one. As part of Dry January, it’s a great idea to give your liver additional support from a key herb that is available. It is also a supplement that you can take longer-term as a protective. When it comes to dietary support for your liver, foods that are rich in the mineral sulphur can leave you feeling a little pongy the day after eating them but they are very beneficial. Some examples include garlic, onion and cruciferous vegetables such as brussels sprouts and cabbage. Sulphur activates liver enzymes that help your body to flush out toxins. Antioxidant-rich watercress is another fine dietary liver support example. There is a bank of impressive research about watercress and its liver-detoxing benefits. Another great option is turmeric. It’s a spice that helps to boost liver detox and it is a wonderfully tasty addition to hot, nutritious meals. Additionally, if you can track down fresh turmeric locally, you can distil this into juices for a lovely kick of extra flavour. The store has been around for over 60 years and began life as a temperance bar selling herbal remedies and non-alcoholic drinks. It became Morecambe Health Foods over 25 years ago and the shop continues to stick to its apothecary roots with a remedy-based approach. It offers a vast range of herbal medicine and nutritional supplements. The shop also has its own organic skincare range and offers a complementary health clinic on the first floor. It provides free consultations and dedicated clinics on bowel health and weight loss. The five members of the store’s team all have a background in natural health.